A Data Type defines the type of input for a property. So when adding a property (on Document Types, Media Types and Members) when selecting the Type you are selecting a Data Type. 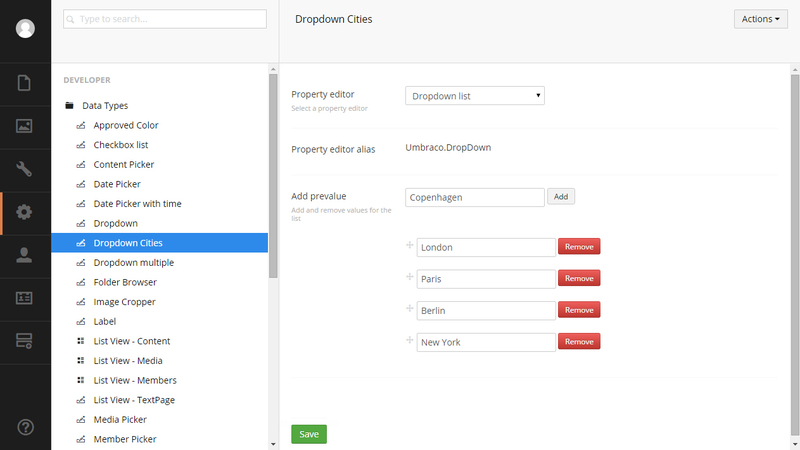 There are a number of preconfigured Data Types available in Umbraco and more can be added in the Developer section. A Data Type can be something very simple (textstring, number, true/false,...) or more complex (multi node tree picker, image cropper, Grid Layout). The Data type references a Property Editor and if the Property Editor has settings these are configured on the Data Type. This means you can have multiple Data Types referencing the same Property Editor. An example of this could be to have two dropdown Data Types both referencing the same dropdown Property Editor. One configured to show a list of cities, the other a list of countries. To create a new Data Type go to the Developer section and click the menu icon to the right of Data Types and select Create. Name the Data Type, we'll call it "Dropdown Cities". Property Editor: This is where you pick the Property Editor that our Dropdown Cities Data Type will be referencing. Pick the Dropdown List and now you will see the configuration options that are available for a Data Type referencing the Dropdown List Property Editor. Property Editor Alias The alias of the Property Editor being used. When you're happy with the list press Save and it is now possible to select this Data Type for a property on Document Types, Media Types and Members. This will then create a dropdown list for the editor to choose from and save the choice as a string. To customize an existing Data Type go to the Developer section, expand the Data Types node and select the Data Type you want to edit. Aside from the Data Types that are available out of the box there are some additional Property Editors to choose from such as the Slider and Macro Container.